Music is the language of love, so weddings are the perfect place to hear it. Hire a microphone for wedding, a musician for wedding ceremony, dj hire for weddings, entertainment for weddings, DJ for weddings. For weddings and engagements, we can supply everything you need to be heard. 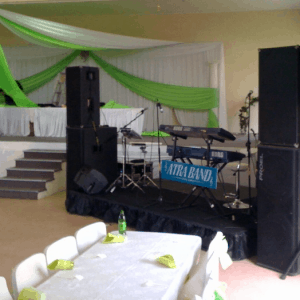 Hire a microphone for wedding, and a PA system for that the entertainment such as musicians, bands and djs to be heard. We hire out sound systems, microphones, lighting, bands, DJ’s, audio technicians, as well as extras such as stages and marquees. The wedding is usually made up of two parts; you may be outdoors for the ceremony and indoors for the reception. A portable PA can, therefore, be very helpful for both the ceremony and the reception speeches and the music. Make sure everyone can hear your vows, the celebrant at the ceremony or the speeches of your family members and friends at the reception, therefore hire a microphone for wedding. Having a Microphone for the celebrant, speeches and vows, ensures that the special memories can be heard clearly. Don’t let your speeches go unheard at the reception. With a wireless microphone or two and a PA system, you can effortlessly enhance the event. No power nearby? We also have portable pa systems that are battery powered or generator powered. You can either pick up the portable PA system for your wedding from us the day before or alternatively hire our DJ or crew to deliver and set it up for you on the day – this is a much more stress-free way to do things! Dj Hire for weddings: Got some special requests music wise? Make sure you let us know so we can prepare the playlist in advance with your songs onboard. Uplight the walls of your reception venue to add a romantic atmosphere or work with a colour theme, elevate the wedding party table on some risers at the front of the room, provide a stage for a DJ, the Band, musicians or speeches or add disco lights to shine on the dance floor. Check out these awesome images of uplighting.